MILWAUKEE — Edwin Maysonet is taking full advantage of his opportunity with the Brewers. And from the looks of it, having a lot of fun while doing so, too. In five games since being called up, Maysonet is 3-for-4 at the plate, including his first career grand slam in the sixth inning of Saturday’s 8-2 Brewers victory. After first baseman Travis Ishikawa was intentionally walked to load the bases with one out, Maysonet crushed an 0-1 sinker from Chris Volstad over the left-field fence. Maysonet, who did not play in the Majors the last two seasons, had not homered since his first career blast on May 29, 2009. He knew he had it too, pointing to Brewers shortstop Cesar Izturis in the dugout on his way to first base. Maysonet got the start on Saturday in place of the injured Rickie Weeks, who is day to day after being hit with a pitch on his left hand and wrist Friday night. Weeks may be back in the lineup on Sunday, but Saturday afternoon belonged to Maysonet. The 30-year-old infielder did not waste his first start with the Brewers, giving a curtain call to the sellout crowd of 42,339 at Miller Park after the grand slam. All this from a guy who said himself he did not expect to have a big role on the club after his callup. It was the first grand slam of the season for the Crew, and the club’s first by a position player in nearly two years. Shaun Marcum, who also started Saturday’s game, had the Brewers’ lone grand slam last season, on July 4 versus the D-backs. Eight runs were more than enough Saturday for Marcum, who gave the Brewers just what they needed after running through every reliever in Friday night’s marathon victory. Marcum tossed seven innings, allowing just one run on three hits, and retired 16 of the last 18 hitters he faced. He also walked a pair and hit a batter, to go along with six strikeouts. It was the third outing of seven innings this season for Marcum, and the first at Miller Park. His previous best outing came on May 1 at San Diego, when he tossed seven shutout innings, allowing three hits and walking four with six strikeouts. Marcum lowered his ERA on the season to 3.07, best among Brewers starting pitchers. He has not allowed more than three earned runs in a game this year, and has pitched at least six innings in all but one outing. Marcum has returned to form nicely of late after struggling last postseason. The entire staff has come around this month for Milwaukee. Marcum’s was the fourth straight quality start for the Crew. Over that stretch, Brewers starters have posted a 1.00 ERA, allowing just three earned runs over 27 innings pitched and holding opponents to a .140 batting average. Combined with the eight-run outburst from the offense, the Brewers turned in one of their most complete performances of the season on Saturday. They’ll look to build on it on Sunday and potentially pick up the club’s first sweep of the year. Weeks was hit by a pitch on his wrist and hand leading off the bottom of the 13th, the second time he was hit in the game. His 97th and 98th career hit by pitches extended Weeks’ club record. After having the injury examined briefly, Weeks remained in the game, eventually scoring the game-winning run for the Brewers. Had he left the game, things would have gotten interesting for Milwaukee, which had just two available players remaining: starting pitchers Marco Estrada (who was in the bullpen) and Yovani Gallardo, who was scheduled to pinch-hit later in the inning. “Yo was going to go to left, Braunie was going to short and Izzy to second,” Roenicke said, referring to left fielder Ryan Braun and shortstop Cesar Izturis. MILWAUKEE — John Axford’s consecutive saves streak ended Friday night. Shortly after, he was headed to the hospital with his wife, who had gone into labor. 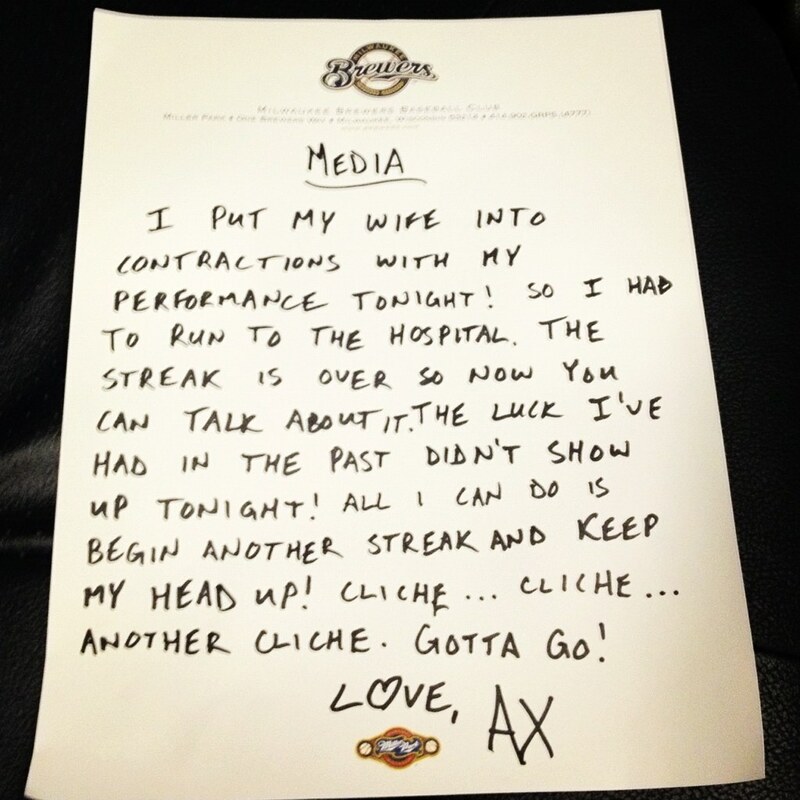 The note was the perfect example of Axford’s personality. Even when something far more important was weighing on his mind, the Brewers closer left a note to the Milwaukee media to explain the situation. The good news for Axford on Saturday morning was that his wife’s contractions were stopped. She was due in June, and had gone into labor early, and now will remain in the hospital a few days, and take it easy for a bit. Axford was expected to be with the club for Saturday’s game. As for Axford’s streak, it ended after he had converted 49 consecutive saves, ranking fourth-best in Major League history. With it having ended more than a year after it began on April 24, 2011, it really put into perspective how impressive the streak was for Axford. Roenicke compared it to Francisco Rodriguez’s 62-save season in 2008 with the Angels. MILWAUKEE — If their Saturday afternoon were uneventful, it would be a welcome change for the Brewers. They already went through enough craziness on Friday night. After playing six innings of a 1-0 pitchers’ duel, the final seven innings turned into a wild, back-and-forth affair. The Cubs and Brewers each scored four in the seventh inning, trading clutch pinch-hits, with David DeJesus’ grand slam and Jonathan Lucroy’s bases-clearing double. They traded runs again in the ninth inning, with John Axford giving up a rare three runs (one earned) and Corey Hart belting a two-run, game-tying homer to extend the game. Following 3 1/2 tense, scoreless innings, the Brewers finally came out with the win. The 5-hour, 4-minute contest was the 17th game in franchise history to eclipse the five-hour mark, and the first since a 15-inning game on April 22, 2004, that lasted 5:22. Only three of the Brewers’ 25 players did not play in the game: starting pitchers Marco Estrada, Yovani Gallardo and Shaun Marcum. The 14 walks in the game also marked the third-highest total in Milwaukee franchise history. But even more crazy events occurred off the field for the Brewers. Axford left shortly after his first blown save in more than a year as his wife had gone into early labor. First-base coach Garth Iorg’s wife fell in a Miller Park parking lot, breaking her left wrist and right elbow. And Corey Hart’s wife hit a deer on her way home from the ballpark. MILWAUKEE — Lost in the shuffle of the Brewers’ marathon 8-7 victory on Friday night were the pitching performances of starter Randy Wolf and relievers Manny Parra and Vinnie Chulk. Despite walking three batters, Wolf delivered his best outing of the season with six scoreless innings. But that was seven frames before the end of the game. After a wild seventh, eighth and ninth innings, Parra and Chulk came on to toss four scoreless innings in the 10th through 13th. Chulk picked up the win, his first since Aug. 19, 2007. Chulk tossed two innings, allowing just two hits and one intentional walk along with two strikeouts. He is 1-0 with a 6.75 ERA in three appearances with the Brewers since being called up from Triple-A Nashville on April 29. Parra went two innings, allowing a hit and two walks with three strikeouts. He has not allowed a run in his last seven appearances, spanning 7 2/3 innings. Opponents have hit .087 (2-for-23) over that stretch. • The Brewers made a handful of Minor League roster moves Saturday. Right-hander Rob Wooten was promoted from Double-A Huntsville to Triple-A Nashville, while lefty Dan Meadows was sent from Nashville to Huntsville. Right-hander Hiram Burgos also was promoted from Class-A Brevard County to Huntsville, while righty Eric Marzec went from Huntsville to Brevard County. All four players will be active for their new teams on Saturday. • Chad Thompson and Mark Williams, the two pitchers who combined on May 4 to toss a no-hitter for Class A Wisconsin, were recognized in an on-field ceremony before Saturday’s game. The two right-handers received plaques presented by Brewers pitching coordinator Lee Tunnell. • Right-hander Shaun Marcum left Friday night’s 5-hour, 13-inning contest early to get some extra rest before his start Saturday afternoon. With Marcum gone, the Brewers had just two available players — starters Yovani Gallardo and Marco Estrada — remaining by the end of the game. MILWAUKEE — In a game so long it featured two sausage races, Corey Hart delivered a pair of clutch late-inning hits, including a walk-off single in the 13th for the Brewers. Hart slapped the first pitch he saw from Cubs reliever Lendy Castillo through the shift to the right of second base and into center field, giving the Brewers an 8-7 victory in a five-hour, four-minute game at Miller Park. With the single, Hart capped a wild finish to a game that had featured just one run through six innings. Over the final seven frames, the Cubs and Brewers combined to plate 14. Hart also had a two-run game-tying homer in the ninth to extend the game. With a double in the fourth — his first hit of the homestand — Hart also snapped an 0-for-12 skid. Vinnie Chulk, the seventh pitcher out of the Brewers’ bullpen and one of 16 used in the game between the teams, pitched a pair of scoreless innings to pick up the win. Chulk started getting himself ready in the eighth and stayed that way until called upon in the 12th. Eventually, it was just Chulk left in the ‘pen with bullpen catcher Marcus Hanel and bullpen coach Stan Kyles. Thanks to a pinch-hit grand slam by the Cubs’ David DeJesus, the Brewers found themselves down, 4-1, in the seventh. With the bases loaded and Kameron Loe coming on to pitch, Cubs manager Dale Sveum called on DeJesus, who connected for his second career grand slam and first career pinch-hit home run. DeJesus also had a triple in the ninth off Brewers closer John Axford, delivering the game-tying run for the Cubs. “For not playing, whatever it was, seven innings, it was one heck of a game,” Sveum said of DeJesus’ performance. Loe had been one of the Brewers’ best pitchers, entering Friday’s game with a club-best 1.93 ERA. He also had held opponents scoreless over his last seven appearances, while limiting them to just three hits in 6 1/3 innings. After the Cubs’ big inning, two walks, a double and a single set up Jonathan Lucroy for a big two-out pinch-hit in the bottom of the seventh. On a 1-1 pitch from Michael Bowden, Lucroy slapped a bases-clearing double into the right-field corner to put Milwaukee back ahead, 5-4. Lucroy extended his hit streak to eight games with the double. He has 13 hits and seven RBIs during that stretch. Axford had converted 49 straight save chances, but gave up three runs (one earned) in the ninth as Chicago took a short-lived 7-5 lead. Axford left immediately following the game, accompanying his wife to the hospital for the birth of their second child. Before the seventh, both teams’ offenses struggled to take advantage of pitching that was just a bit off the mark. In 11 innings, starters Matt Garza and Randy Wolf combined to walk eight while giving up seven hits. But neither offense could capitalize, as one Brewers run was all that was on the board after six frames. In the end, the game was just the type of chess match that Roenicke said he enjoys squaring off against Sveum, though a bit longer than he likely had hoped. The Brewers and Cubs will have a quick turnaround with Saturday’s 12:05 p.m. CT start, but the Crew will hope to use Friday’s victory as a potential momentum builder. “It was important to win it,” Roenicke said. MILWAUKEE — There has not been much to like about the Brewers offensively through the first five weeks of the season. But one bright spot has been catcher Jonathan Lucroy. Entering the series opener against the Cubs, Lucroy’s .321 batting average ranked first among National League catchers. He added to that Friday with a pinch-hit three-run double with two outs in the seventh inning to put the Brewers ahead in an eventual 8-7, 13-inning win. “Luc’s a good hitter,” Milwaukee manager Ron Roenicke said before the game. “He sees the ball really well, he doesn’t chase a lot, and he can square up a baseball. Lucroy extended his hit streak to eight games with the double, collecting 13 hits over that stretch and seven RBIs. On the season, Lucroy has a pair of home runs and has driven in 15 runs. In his third year with the Brewers and first as the Opening Day catcher, Lucroy has become one of the club’s best and most versatile hitters. MILWAUKEE — Brewers closer John Axford finally blew a save. But his teammates picked him up. After converting a club-record 49 in a row, Axford could not close out the 50th on Friday night. A one-out RBI triple by the Cubs’ David DeJesus tied the game at 5 and snapped Axford’s streak, which had stretched back to April 24, 2011. Axford gave up three runs, but just one earned, and struck out three over two-thirds of an inning before being replaced by manager Ron Roenicke. In the bottom of the ninth, a two-run blast by Corey Hart off Cubs closer Rafael Dolis tied the game at 7, taking Axford off the hook for the loss in an eventual 8-7 Milwaukee win in 13 innings. Axford left immediately following the game, accompanying his wife to the hospital for the birth of their second child. Axford had not blown a save since April 18, 2011, in Philadelphia. The Brewers came back to win that game, 6-3, over the Phillies. His streak of 49 consecutive saves ranks as the fourth best in Major League history. Only the Dodgers’ Eric Gagne (84), Boston’s Tom Gordon (54) and Detroit’s Jose Valverde (51) have recorded longer streaks. Valverde’s was snapped earlier this season on Opening Day, in a Tigers victory over the Red Sox. The blown save added to a wild finish in a game that featured just one run through six innings. Over the next three frames, the Cubs and Brewers combined for 13 runs. MILWAUKEE — Even as his season-opening slump continues, don’t expect to see Rickie Weeks come out of the Brewers’ lineup anytime soon. A lot of players hitting the way Weeks has been — with a .164 average on the season and hitless in his last 13 at-bats — would get a day off for a break that’s as much mental as physical. But Weeks is not that type of player. “We need Rickie to hit,” Brewers manager Ron Roenicke said. “So whatever way I can get him to start swinging like he did last year and the years before that. But he’s not going to do it when he’s sitting on the bench. Entering Friday’s game, Weeks had just an .083 average over his last 10 games, with just three hits in 36 at-bats. The biggest positive is that his approach has kept his on-base percentage well above the low batting average. With nine walks, Weeks has a .267 on-base over the last 10 games, nearly 200 points higher than his average during that time. That approach, along with Weeks’ personality and mentality lead Roenicke to believe the club is better off with its starting second baseman in the lineup than on the bench. MILWAUKEE — Ron Roenicke had an enjoyable, but busy off-day Thursday. The Brewers manager made appearances at three events, including the Wisconsin Sports Awards, where he was named Coach of the Year in the state. The other two events honored Del Crandall, whom Roenicke played for in both the Minors and Major Leagues. “I have a lot of respect for him, and we’ve become good friends,” Roenicke said. Along with Hall of Fame slugger Henry Aaron, Crandall was named to the Milwaukee Braves’ Honor Roll at Miller Park. Crandall played the first 13 years of his career with the Braves, including two in Boston before the club moved to Milwaukee. Crandall also managed the Brewers for four years from 1972-75 and the Mariners for two years in ’83 and ’84. Between those two stints in the Majors, Crandall managed Roenicke and the Albuquerque Dukes, the Dodgers’ Triple-A affiliate. MILWAUKEE — Over the course of five days next week, Brewers Community Foundation, along with Ryan Braun and Habitat for Humanity, will build 10 new homes for Milwaukee families. Milwaukee Habitat for Humanity’s 2012 Build-A-Thon begins Monday, and a crew of approximately 250 volunteers contributing 8,000 volunteer hours will help build the new homes. Braun has lent his support to the cause through a $50,000 donation. As the build week draws to a close next Friday, there will be a “Brewers-style” tailgate at Hephatha Lutheran Church in Milwaukee’s Amani neighborhood, where the houses also will be built. Braun also will participate in an on-field check presentation before the game that night against the Twins. MILWAUKEE — On their way to a National League Central title last season, Brewers starting pitchers avoided that one big inning that changes a game. Those blowup innings are becoming all too common for this year’s club. That was the case on Monday, as one big inning was too much for the Brewers in a 6-1 loss to the Reds in the series opener at Miller Park. “I don’t know why we’re having those tough innings,” said Brewers manager Ron Roenicke. “It’s hard to explain when those innings happen. After retiring the first nine Reds in order, starter Marco Estrada ran into trouble. The Reds connected for five straight hits to start the fourth inning, including a pair of home runs. It was Jay Bruce’s three-run blast deep to right-center field that put things out of reach and capped the five-run frame. “The first four innings were a blur to me,” Estrada said. “I didn’t feel comfortable out there. I wasn’t making good pitches I didn’t think. I got away with a lot of pitches. Estrada did not allow a run in the other six innings he pitched, and gave up just two hits outside of the fourth. He allowed eight hits in all with five strikeouts and zero walks. The second time through the order has been an issue for Estrada through three starts this season. Opposing hitters are 2-for-27 and scoreless the first time through, compared with a 10-for-26 mark and nine runs on Estrada’s second trip through the order. For the Reds, the second time through the order was simply the fourth inning, as they sent nine batters to the plate. Estrada admitted that not feeling comfortable on the mound likely had at least something to do with the fact that he had not pitched in nine days. Ryan Braun’s ninth homer of the season — a solo shot in the first — constituted all of the Brewers’ offense. Milwaukee had chances to cut into the Reds’ lead in both the fourth (runners on second and third with none out) and seventh (first and second with two outs) innings, but could not capitalize. “It’s frustrating when you got out there and you put all the work in, but sometimes you just don’t feel it,” said second baseman Rickie Weeks, who went 0-for-4 with a strikeout, dropping his average to just .174. Reds starter Bronson Arroyo was in control throughout his 6 2/3 innings, giving up just one run on six hits with nine strikeouts and one walk. Five of the nine strikeouts caught the Brewers looking. Arroyo certainly did not mind catching the Brewers’ offense when it was down, either. “It was a different lineup than you expect against these guys with the guys they had hurt,” Arroyo said. For the Brewers, on the other hand, the loss just added to the frustration that continues to build with each game. Every injury and poor hitting or pitching performance just digs the club into a deeper hole. The Brewers fell into a tie with the Cubs for last place on Monday at 12-17, well behind the NL Central-leading Cardinals. “I think the biggest thing is keep coming to the ballpark,” Weeks said. “Baseball, I don’t care what you do, you can have some big ups and big downs in this game. You’ve just got to keep coming to the ballpark. MILWAUKEE — Brewers shortstop Alex Gonzalez, who was placed on the 15-day disabled list on Sunday, has a torn ACL in his right knee. Gonzalez underwent an MRI on Monday that confirmed the injury, which occurred when he slid awkwardly into second base in the second inning of Saturday’s 5-2 loss to the Giants. Gonzalez was moving around the clubhouse after the game Saturday on crutches, and again Monday afternoon before the Brewers opened up a six-game homestand at Miller Park. Gonzalez batted .259 with four home runs, 15 RBIs and four doubles in 24 games for the Brewers this season. The injury bug bit the Brewers during their nine-game road trip, affecting Gonzalez, first baseman Gamel (torn ACL), starting pitcher Chris Narveson (shoulder surgery), outfielder Ryan Braun (stiff right Achilles) and outfielder Carlos Gomez (left hamstring strain). With the likely season-ending injury for Gonzalez, his absence creates an opportunity for Cesar Izturis and Edwin Maysonet. Izturis has taken over as the Brewers’ primary shortstop, while Maysonet will play a utility role off the bench for the Crew with occasional starts. They’re happy to play bigger roles with the club, but a significant injury to a teammate is a tough way for Izturis and Maysonet to get such promotions. Maysonet was invited to join the Brewers in Spring Training each of the last two seasons, but had not played in the Major Leagues since 2009 with the Houston Astros, until appearing in the final three innings of Sunday night’s loss at San Francisco. Maysonet knows his role likely will not be a particularly significant one.